Summary: Cub Scouts sell popcorn every year to raise funds for their Packs. Each year popcorn coordinators have to manually aggregate dozens of hand-written popcorn order forms. We built a popcorn order capture system using Salesforce, saving time, eliminating errors and improving the way popcorn orders get done for our scouts. Based on how things go with our proof of concept prototype, we are looking to make an even better system that could also be used by other Packs! My son is in his 4th year as a Cub Scout, which means he is currently participating in his 4th season of popcorn sales to raise funds for his Pack. He really enjoys popcorn sales! Two years ago, my husband Walter got involved as the “Popcorn Kernel,” the person in charge of running the popcorn fundraiser program for the Pack. Amongst other things, the Popcorn Kernel facilitates the orders that each scout collects by individually selling popcorn to family, friends and door-to-door. When a Cub Scout makes a sale, the scout writes the details on his or her order form. At the end of the selling period, the Popcorn Kernel gathers the forms from each individual scout and aggregates them into one order for the Pack. A few weeks later, when the product comes in, the Popcorn Kernel receives the product, and distributes the products along with the forms back to the scouts so they can deliver the popcorn. This sounds simple enough, right? Well, to put it mildly, this job proved to be WAY more complicated and time-consuming than we had anticipated. 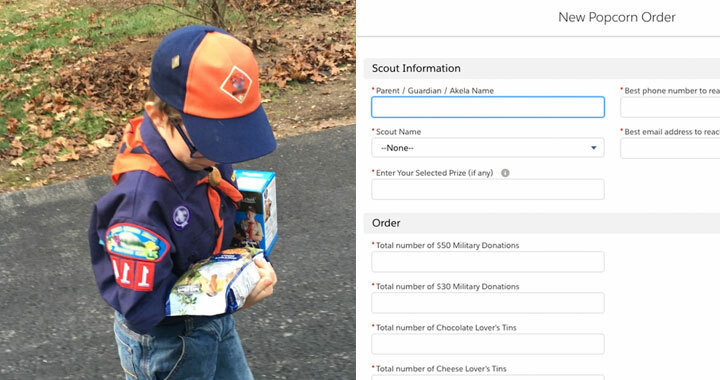 First, there was a logistics problem: scouts needed their order forms to know which popcorn to deliver to which customer, but Walter needed their forms to determine the Pack’s popcorn order. With tight deadlines for getting the Pack order in, it can be quite challenging to manage this part of the process! Second, further complicating matters, Walter wasn’t at all prepared for how difficult it was to decipher some of the hand-written forms. Here was another logistics problem: going straight to the source by asking the scout or parent about the order wasn’t as simple as it sounds either. Since they didn’t have records of their own to reference while Walter was using the order forms this problem couldn’t be solved with a quick phone call or email. Often to get an answer Walter had to get together in person to have them look at the form or send images back and forth so they could see what he was asking about and make their best guess. All of this could turn what should be a few minutes of data entry into a process that could take hours or days – and that is just for one scout’s order! Our Pack has experienced tremendous growth over the last few years, which has been wonderful for the Pack! For the Popcorn Kernel, however, as the Pack grows so does the challenge with managing popcorn orders. In addition, our son is getting older and will soon be graduating Cub Scouts, so Walter thought that this year would be a good time to hand over the Popcorn Kernel reins to a parent of a younger scout. This way Walter can easily stay very involved in the popcorn program while our son is still part of the Pack to help ensure a smooth transition. As part of this, he began thinking about ways to make the process easier for the Popcorn Kernels going forward. Meanwhile, after pausing my career for almost a decade while I stayed home to raise our 3 children, this year I decided to re-enter the workforce when Walter and I launched Elly Associates. Part of my journey is getting Salesforce certified. In addition to the time that I’ve been spending on Salesforce Trailhead, Walter suggested that as part of my studies I see if there could be a way to solve the popcorn order form problem using Salesforce. The challenge I faced was how to create a system that enabled multiple people to easily share the data they captured on their Scout’s door-to-door order forms. To complicate matters further, I needed to make sure that every product on an order would be accounted for to help minimize typos or errors. For example, if a product is not needed for a specific order, we must record a “zero quantity” for that product rather than have it simply be omitted from the order. To tackle this challenge, I created a proof of concept system leveraging a Custom Object to capture Cub Scout and order data all in one screen. I used required fields to ensure “zero quantity” reporting for products that weren’t needed on a given order. I was also able to include information that wasn’t on the order form but is needed by the Popcorn Kernel, such as how much a scout had earned from sales where the scout already had product on hand (not to be included in the order) and which of the prizes the scout would like based on their total earnings. This season our Pack is testing my prototype’s design. So far I am happy to report that it is a success! Ideally, once we have a production design that is a proven success for our Pack, I would like to look at ways to share the design via AppExchange so other Packs could use it as well. It would be fantastic if from there I could expand it even more for use by various youth organizations for their fundraising efforts! I have learned so much already from this project and this is clearly just the beginning. I am so excited to see the final results from our prototype testing at the end of popcorn season, to learn even more as I begin work on the next generation / “ready for production” system, and to continue learning as I grow more familiar with all the ways Salesforce can help our Pack. I am excited to share how Salesforce can be used to help organizations like Cub Scouts! I am curious to know if anyone else has leveraged Salesforce for a similar purpose and how they tackled their design, especially around the concept of “zero quantity” reporting enforcement. I would also be interested to hear your ideas on how to make the system even better for the future. Thanks for reading, and please contact us to share your thoughts! Posted in Salesforce and tagged App Cloud, Salesforce. Led by Walter and Tara Elly, with over 30 combined years of business and technology experience we have helped hundreds of businesses of all shapes and sizes, from small startups to the Fortune 100. Whether you need some part-time help to make progress on your system’s roadmap, want to work with an experienced system architect to help execute on your vision, or would like to partner with us in other ways, Elly Associates is here for you. Let’s chat! "I've known Walter for five years, and I had the pleasure of working with him on about a dozen Salesforce implementations. I can personally testify to Walter Elly's experience as one of the best."